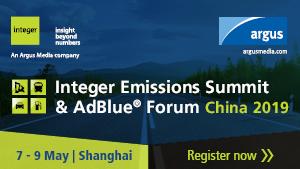 The conference will provide the ideal platform for senior decision makers across the emission control and AdBlue® industries to share knowledge and develop business in China and beyond. There will be in-depth discussions on the most recent developments, regulations and challenges affecting the on- and non-road markets, and many opportunities to network and forge new partnerships. Topics of discussion will span the heavy-duty, light-duty and non-road mobile machinery sectors, as well as the AdBlue® market. Register early to save $200 on IES & AdBlue® Forum China 2019. Book your tickets securely online, or click the ‘Register here’ button to book your place. This discount closes on 29th March 2019. Don’t let your competitors take the best insights and partnerships! Join us to propel your business forward and stay up-to-speed with China’s emissions control market dynamics.